This page will provide you with information about flexible cystoscopy. For further details, please speak to your consultant. What are the alternatives to the procedure? If information is needed about the problem, a scan may be recommended. A rigid cystoscopy (under a general or spinal anaesthetic) may be recommended in order for your surgeon to treat certain issues. 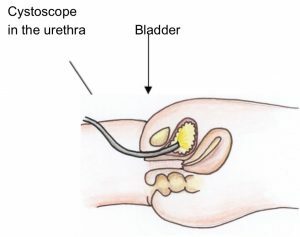 The doctor passes the cystoscope into the urethra (see Figure 1). To help diagnose any potential problems, they will flush fluid through the cystoscope into the bladder. The doctor will then look for problems in the bladder lining using the cystoscope. If a stone or growth is encountered during the procedure, it is possible to remove it through the cystoscope. The whole procedure will take about approximately five minutes. You will be able to go home once you have passed urine and unless advised otherwise, you should be able to go back to work the following day. An exercise regime should help to prepare for the procedure and aid recovery afterwards. Check with your GP before doing so. If you require treatment or follow-up, the healthcare team will discuss it with you after the procedure, along with any results. A flexible cystoscopy is a safe and effective way of determining any problems in the bladder. Price for this procedure from £1515.